This is my first hair-do tutorial! I am very excited about this hair style. 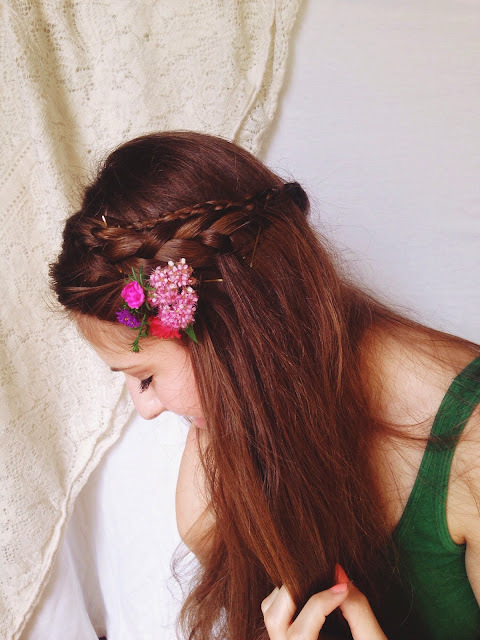 I found this hair style on Pinterest, and I would say the site that it is actually from, but there was none! So, I had to figure it out on my own. I am going to just go ahead and get into it. To make my hair extra soft, shiny, and healthier looking, I pour a small bit of avocado oil in my conditioner when I take a shower. Now, you might think this part is gross, but it is actually great for your hair! I don't wash my hair everyday, not even every other day. I wash my hair every four days. Yes, four. You can get a shower cap and go about your daily shower without washing your hair every single day. That just strips your head of it's natural oils. 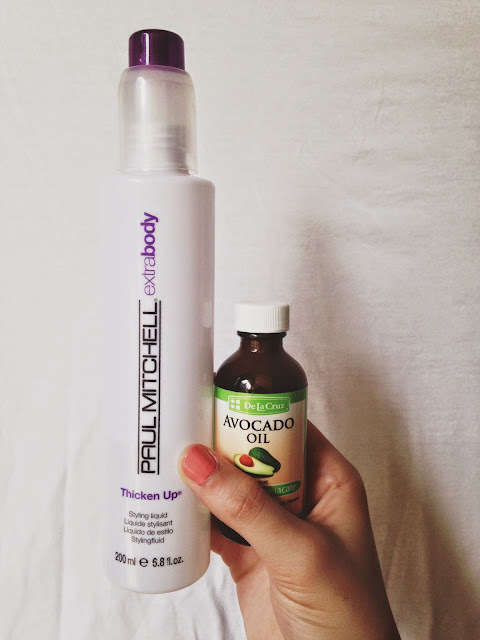 This Paul Mitchell Extra Body is amazing! It not only adds volume, but it texturizes, keep the frizz down. 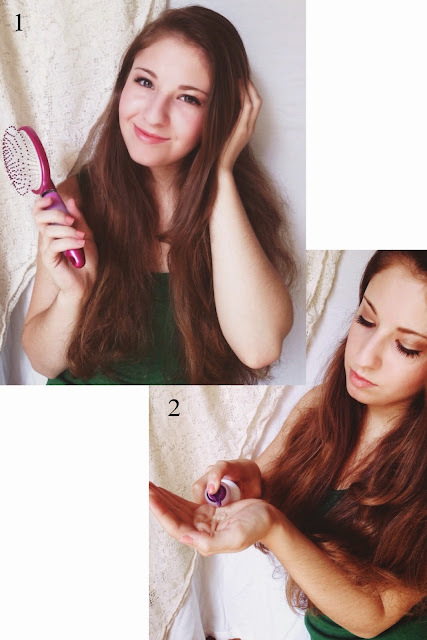 You want to start with brushed hair, and parted with more hair on one side than the other. It doesn't matter what side, whichever you prefer. After it is all brushed, you pump some of the Paul Mitchell Extra Body in your hands, or if you have other volumizing gel/spray, whatever you use to help style your hair, run that through your hair after brushing. 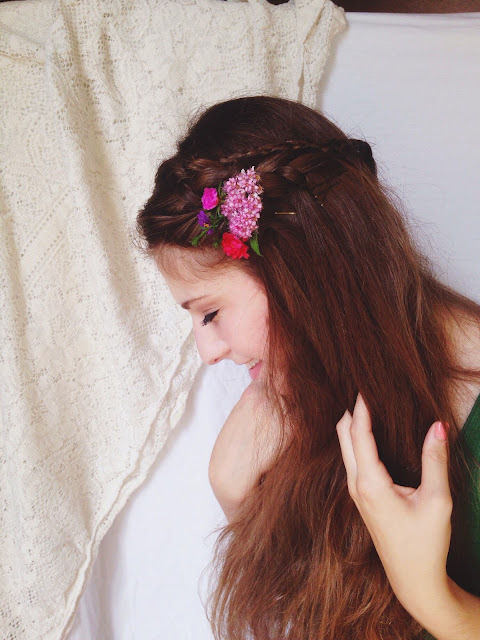 Now we can get started with the Goddess Braid. Take a portion of your hair on the thicker side. You can see in the photo what to grab and what to leave. The next step, which is number 4 according to the pictures, begin upside-down braiding that portion. Braid the hair back so it won't look funny when you pin it. Don't braid it all day down the length of your hair if you have long hair, just do it half way or so. Then, grab a hold of the braid with one hand, and gently spread the braid out to make the braid a little bigger and thicker. Pin it back with a bobby pin or two. Next, after you pin the bigger braid up, take a small portion of your hair from the middle part of the back of your head. Braid upside-down upward. 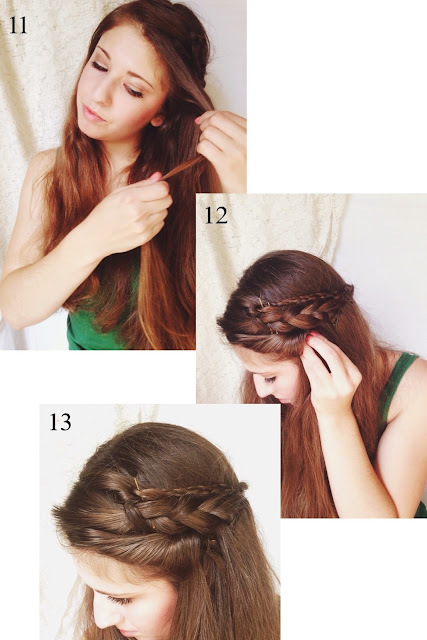 You are making a layering braid to top off the bigger, first braid. The photo will show this. 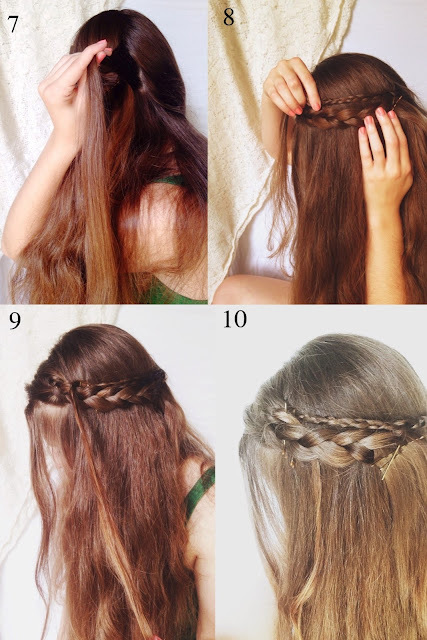 You want to make the braid long so it goes the length of the first, bigger braid. When the smaller, second braid is complete, pin it and try and the bobby pin under the top of the first, bigger braid. 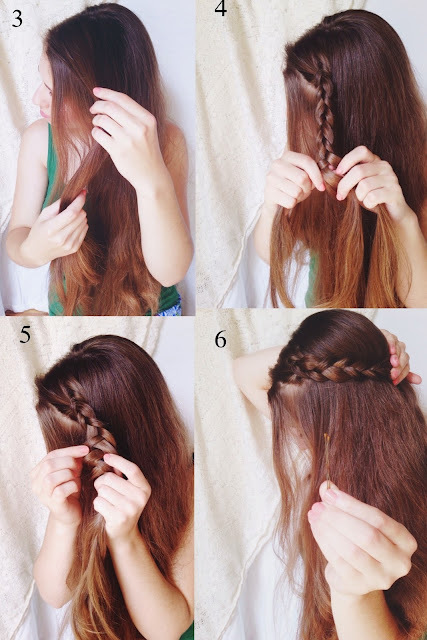 If there is left over from the smaller braid, just lace it under the bigger braid. The excess hair is now hidden. 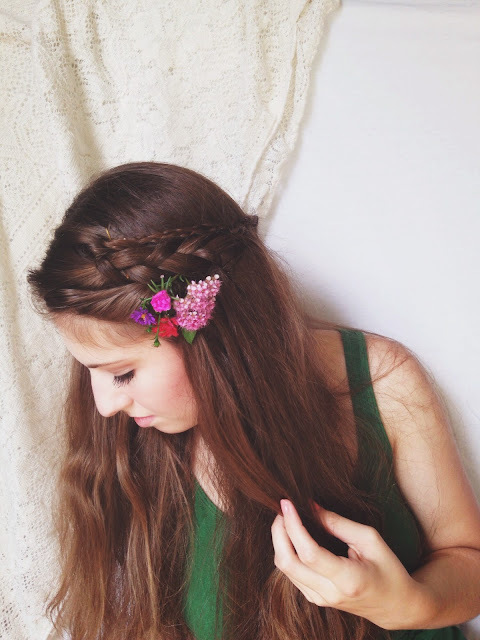 Now, take a small portion of hair from the front of your hair, the hair the frames your face on the side you braided on. Do a twist, almost like a victory roll from the 40's, and twist in towards the big braid. Pin it with bobby pin(s), and viola! 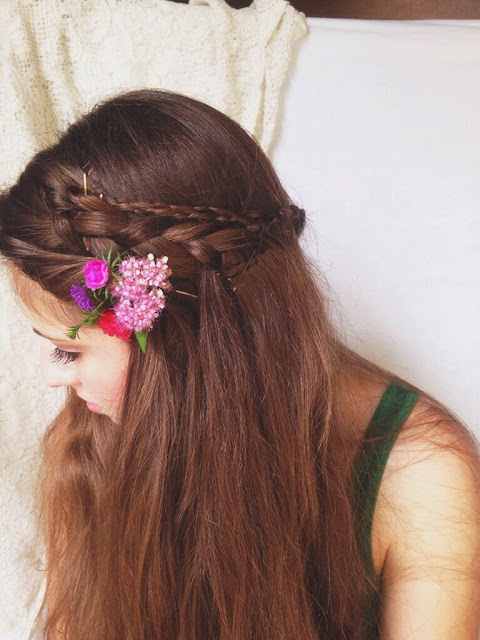 This is completely optional, but I wanted to add flowers to my hair. It is more goddess-like with the little flowers. I am not a vlogger, I don't like doing videos, every once in a while, I do a video to document something, but I like to do my tutorials in writing. I don't mind videos, but I like writing out the steps. When I start doing makeup tutorials, I will do videos. There are a lot of bloggers who vlog too. I hope you enjoyed this tutorial! I found a treasure trove of braids and I am so excited to do tutorials on them! Oh thank you! You are so sweet! I am going to check out your blog. I am so glad this helped!